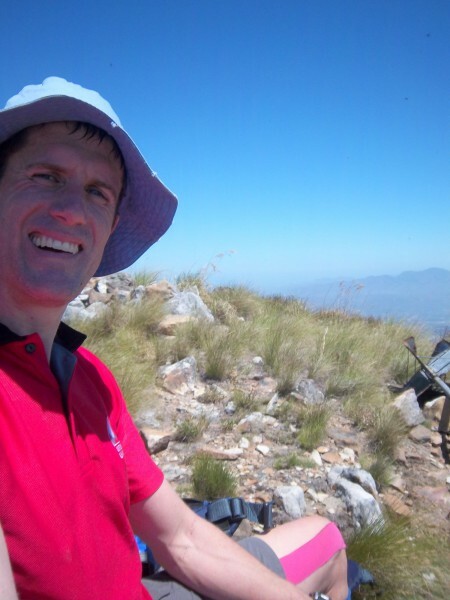 In mid-December 2014, Coos Diener together with Inus van Rooyen and Bennie Steyn, made an attempt on the Jonkershoek Marathon, aiming to better the long-standing record of 9 hours 40 minutes set by Henco Jordaan in October 2000. Here’s Coos’ account of their day spent on this gruelling 30 kilometre route. The Jonkershoek Marathon (read about the history and route), preparation and attempt at the record. A personal journey. In the challenge known as the Jonkershoek Marathon hikers attempt to climb seven peaks in the Jonkershoek valley, near Stellenbosch, in a day. This is a personal account of an attempt on the current record of 9 hours and 40 minutes. 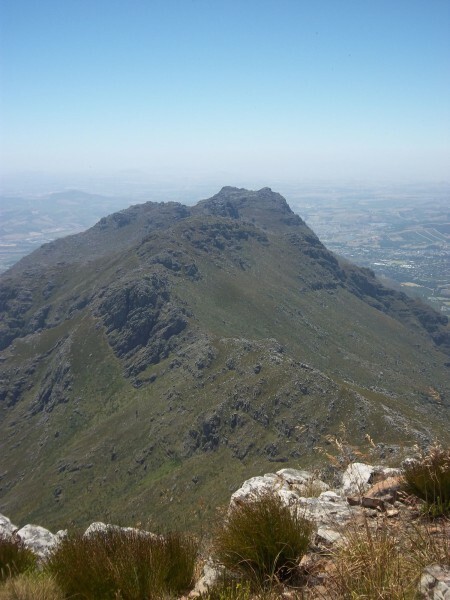 My introduction to the mountains of the Cape came at a very young age as my parents were (and still are) very involved in the Stellenbosch section of the Mountain Club of South Africa (MCSA). Through the MCSA I met two key people that would shape my thoughts regarding hiking and mountaineering. The first was Oom Ernst Lotz, the legendary hiker, climber and explorer of the Jonkershoek valley who wrote the definitive guide “Jonkershoek en sy berge”. It was probably also around the time I met him that I first heard about the Jonkershoek marathon. By the tone in which people referred to it I had gathered that it was a serious undertaking, only to be attempted by dedicated mountain men and women. The marathon route traverses all the peaks on the rim of the Jonkershoek valley, in total covering more than 30 kilometers, of which less than a quarter is on established hiking paths, with a combined vertical ascent of over 3000 meters: by all accounts a long day in the mountains. The second person I met at this impressionable age was Teuns Kok. We were only properly introduced much later, but I can distinctly remember that my mother referred to Teuns as someone who runs or hikes very fast in the mountains. She meant it as a warning, but I took it as the norm for fit mountain men. However, this was the 80’s and only “event” that I knew of where this happened was the Jonkershoek marathon. And so my dream was born. But I did not know the route, so I had to find someone to show me the way, since some sections of the route are quite near impossible. The only people I knew who did the route on a regular basis were all members of the Jordaan family from De Doorns. The Jordaan’s family farm is on the slopes of Matroosberg, the highest mountain in the Boland, so they probably cannot help but be a very active bunch. At that stage the patriarch, oom Retief, did the marathon almost annually and his second eldest son Henco is the current record holder. I joined oom Retief and youngest son Christian for their 2002 attempt of the marathon and was blown away by the experience. In 2003 I joined him again. We had a perfect day and I managed to finish the route in 9 hours and 44 minutes, just 4 minutes off the record! Unfortunately, I missed it since thought I was way off the record by the time I reached the summit of Haelkop, the last peak. Hence I did not bother to check my watch after that and therefore realized too late that I was actually in with a shot at the record. After that attempt I knew the record was vulnerable and I set out to prepare myself to break it. Step one is to get to know the route by heart. The second step is safety, since the marathon is not the type of route that I would do solo, although it has been done by Lydia Cilliers (née Roos) who was the record holder for more than a decade (that’s right boys – she’s a woman). Not soloing meant that I would have to find some like-minded individuals. They are not necessarily in short supply, but it has to be people who I felt comfortable to leave to their own devices to chase the record if and when it came to that. That meant they also had to know the route very well. Such individuals are however quite scarce, since getting to know the route takes some committed hiking. I had some outdoor fish to fry, and the marathon was always at the back of my head. Opportunity came along at the beginning of 2014 when Inus van Rooyen and Bennie Steyn contacted me. They did some marathon scouting trips but could not hack the route’s crux between Pieke and Rifberg. They made various enquires and ended up contacting Teuns who in turn referred them to me. We corresponded and in September we started to scout the route. By October a date for the attempt was set for the middle of November. In addition to Inus and Bennie joining me, various seconds were organised: some to meet us en route, while others would join for sections in order to keep us at record pace. It was arguably the best-organised attempt in the history of the marathon (which stretches over more than 50 years). That is until a late spring storm rolled in and covered sections of the route in powdery white stuff, which meant that the attempt had to be postponed to the end of the summer. However, an unexpected turn of events led to an attempt in middle December. By then the warm weather was upon us and unfortunately most of the seconds had already gone on holiday. All which just implied that we had to take a more traditional approach to the marathon. On Saturday the 13th of December just after 04:00 Inus, Bennie and I started our journey. We were joined by Hannes van Rensburg, as well as two others who accompanied us for the first hour. Two hours after leaving the summit of Botmaskop we were on top of the Pieke, the iconic twin peaks of the Jonkershoek Valley. Since this was the first leg of the day and to take advantage of the cooler temperature we pushed to Pieke without taking a break at the summit of Square Tower. Thereby the biggest single ascent of the day was done in one sitting, which is recommended if you want to avoid spending a longer than necessary day in the mountains. At that stage our chances of not doing that were looking good, since we were on par with the record. After a quick snack and a couple of minutes off our feet we tackled the crossing to Rifberg (Virgin peak), the crux of the marathon. Here you have to climb down a steep grassy gulley and over a knife edge ridge to the foot of a big rock obstacle. The climb over this obstacle is daunting since you have a clear view to the bottom of the valley on both sides. After that we scrambled up a steep flank, which looks almost vertical when viewed from a distance. Your only comfort is that the view from the top must be amazing. At the top of the slope we traversed the mouth of a small cave and climbed onto the ridge from where we could walk over to First Ridge peak. By this time our group had split up. I was comfortable doing so, since we agreed beforehand that the others would stay together and we all knew the route and had sufficient supplies as well as the relevant emergency contacts. By this time it was also apparent that it was going to be a hot day with clear skies and very little breeze – not the ideal day for a record attempt but at least our chances of getting lost was minimal. My water supply was at 50%, but I could resupply at Bergriviernek, about 90 minutes away. Judging by my splits I was about 5 minutes ahead of the record and feeling confident, despite a little niggle in my left knee hampering my progress on the climbs. The descent from Rifberg is steep and should not be rushed. Upon reaching the connecting ridge at the bottom I traversed the narrow, slightly exposed ledge in a wide gulley, called Slabs. In case of an emergency Slabs is one of the more straightforward escape routes to Jonkershoek and anyone attempting to do the marathon should be familiar with it. 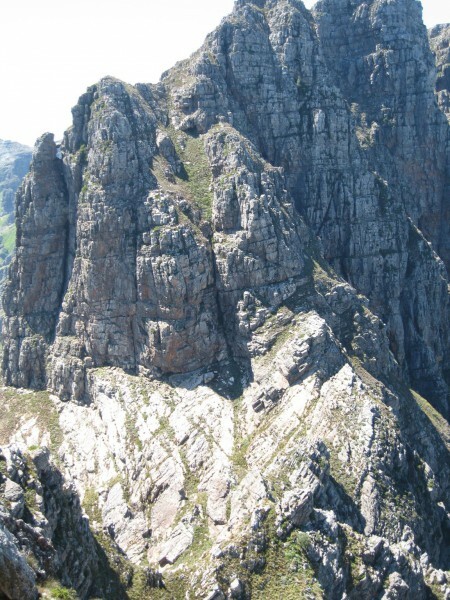 From the top of Slabs it is an easy walk over to Second and Third Ridge peaks, also known as Katedraal (Afrikaans for cathedral) due to its impressive rock towers. The descent to Bergriviernek is marked by stone cairns, but should be scouted beforehand since any deviation from the route will most likely end in a sheer drop. I recently scouted this section and thus I pushed on the descent and arrived at Bergriviernek 7 minutes ahead of record pace. I did not rest there but climbed up to the stream coming down from the Dwarsberg plato, about a kilometer away. This is one of two places where you are almost guaranteed to find water on route (the other one being the small vlei at the top of Swartboskloof). At the stream I was met by some of my family, who brought us sandwiches and moral support. By then it was stinking hot and I knew I had to push hard on the next section, the only part of the route with a decent path. After refilling my two hydration packs and gulping down a sandwich with some meal replacement I soldiered on. Unfortunately the big push did not materalise. From Bergriviernek to the top of Swartboskloof the route follows the Panorama trail which is easily joggable, if you have the legs for it. This time I did not. However, this is probably the best section of the route to get well ahead of the record. My advantage of 7 minutes simply wasn’t enough. By the time I reached the stream at Swartboskloof I was 5 minutes behind with no real change of making it up. So the record was off the table, but I decided to keep pushing since the day was far from over. At this stage about two thirds of the distance was covered, but the biggest challenge of the day was still to come: Haelkop with its 400 meters gain in altitude, which makes it the second biggest climb of the day after the Pieke. Fatigue started to set in and with my concentration lacking I struggled to stay on the route that seemed so obvious less than a month ago. Summiting Haelkop I had little time or need to admire the spectacular view which stretches from Rooiels past Cape Point to the Winterhoek Mountains near Porterville, since most of it was covered in the typical haze of a hot summer’s day. The only thing that interested me, and probably anyone who has come to this point in the marathon, is that Stellenbosch Mountain still looks very far away. From Haelkop the route goes down a steep valley, thus avoiding the cliffs on the ridge. Once past these I cut back to the ridge and followed it down to an old repeater station. From there the temptation was strong to cut directly across the slope to Stellenbosch Mountain, but I have learned that this seemingly shorter route only leads to frustration and lots of falling around. Unfortunately even on the ridge the going is not easy, with uneven sections and lots of scrambling. The final push to the finish is across a long valley/slope. Here the heat and the effort of the day suddenly caught up with me. I was starting to feel very nauseous but forced myself to eat and drink something. Once back on my feet it was a slow grind to the finish. I dragged myself up the final climb, not caring about anything else except to get off my feet and off this mountain. I reached the beacon on top of Stellenbosch Mountain 10 hours and 40 minutes after leaving Botmaskop, which was staring at me from across the valley barely five ilometers away. I was thankful to have made it, albeit an hour off the record. But the record can wait for another day. I did allow my eye to follow the route all around the valley as I thought that there cannot be another challenge like the Jonkershoek Marathon: it is truly unique. After resting a bit there were still two things to deal with: the first was finding out how the others were getting on and secondly, getting myself off the mountain. I walked over to where the path down to Assegaaibosch / Jonkershoek splits from the route. Just as I got there I received a sms from Bennie which told me that they were ascending Haelkop. Since I probably would have had to wait more than three hours for them to arrive, I opted to start my descent. Initially the path was relatively clear, but it quickly disappeared and I started to bundu bash. As I got down (after almost 2 hours) I got word that the three behind me took a wrong turn. The information was sketchy since their phones’ batteries were dying, but in their estimation another 2 hours have been added to their time in the mountain. In the end I met them about 5 hours later. Then I heard that on Haelkop they chose the wrong valley for their descent. That is in spite of us scouting the route a month before and the fact that the direction you need to take is relatively obvious since you can see your final destination. But this is not a testament to a lack of navigational skills, but rather to the huge physical and mental effort that the marathon exacts: to such an extent that even the obvious becomes unclear. Luckily they are seasoned adventure racers and could correct their error. However, instead of climbing back to the summit once they realised their mistake (which is probably the right thing to do, but under the circumstances I probably also would not) they traversed the slope back to the ridge. This took them through thick alien vegetation as well as very rocky sections, adding to their misadventure. In the end they completed the route in the dark, which happens all too frequently with marathon attempts, but they were prepared for this torches and made it safely off the mountain. We all met for breakfast two days later to share stories and debrief. There was general agreement that the Jonkershoek Marathon is a beast of an adventure that should never be under estimated. But we will be back and even better prepared. Maybe then the record will be broken. Coos Diener is an Extreme Lights brand ambassador. My thanks to Charl, from Extreme Lights, for letting me know about this most wonderful challenge.